Non-linear story telling is by no means a new concept in film, however the idea of a non-linear score to accompany a film that exhibits such structural complexities is something rarely found in the current film climate. In today’s film industry, the thought of venturing beyond the comfort zone is seemingly a frightening one for many filmmakers. This not only applies to the film itself but also to the score. The easy way to success is often established through the use of a template, one that defines the dos and don’ts of the scoring process. Therefore it is a pleasant surprise when the template is discarded in favour of something that is almost entirely unique in its form. 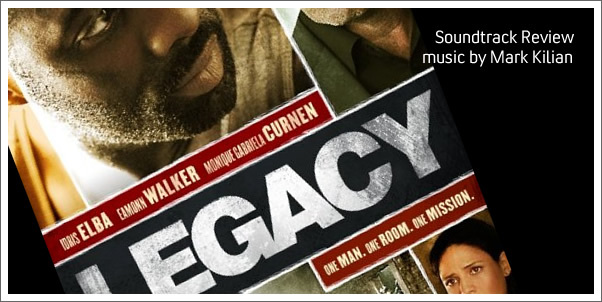 On first listen, Mark Kilian’s score for LEGACY is one of pure instinct and reaction. It holds no single specific genre and lacks any sort of recognisable theme in its composition and therefore provides an unpredictable, innovative listening experience. The music on offer ranges from your typical pulsating action thriller to what borders on horror. Such an amalgamation only serves to accelerate the fraught pace and suspense of LEGACY.